"Her face immediately lit up." 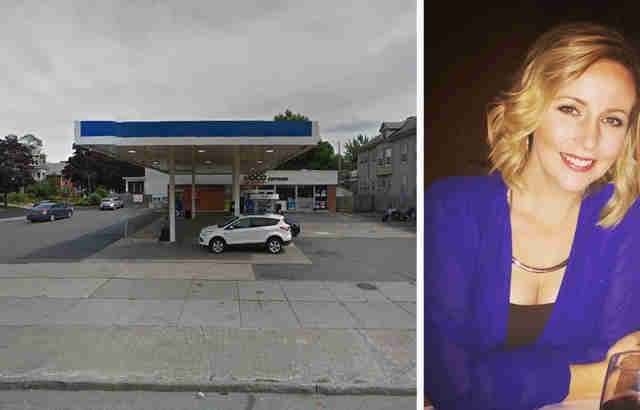 When Kaitlyn McNamara stopped by this Buffalo, New York, gas station on Sunday morning, she had no idea she'd soon see something that would move her to tears. Prior to entering the station's market to purchase some coffee, McNamara noticed a woman and her dog seated on the sidewalk out front. 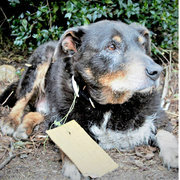 Based on her appearance, and the bag she seemed to be toting, McNamara surmised that the woman was homeless or living on the streets — but her canine companion nevertheless appeared to be fit, healthy and well taken care of. As McNamara stepped inside, she noticed two Buffalo Police officers a few paces behind her. One stopped to talk to the woman out front: "I heard the officer ask to pet her dog before walking into the store," McNamara told The Dodo. 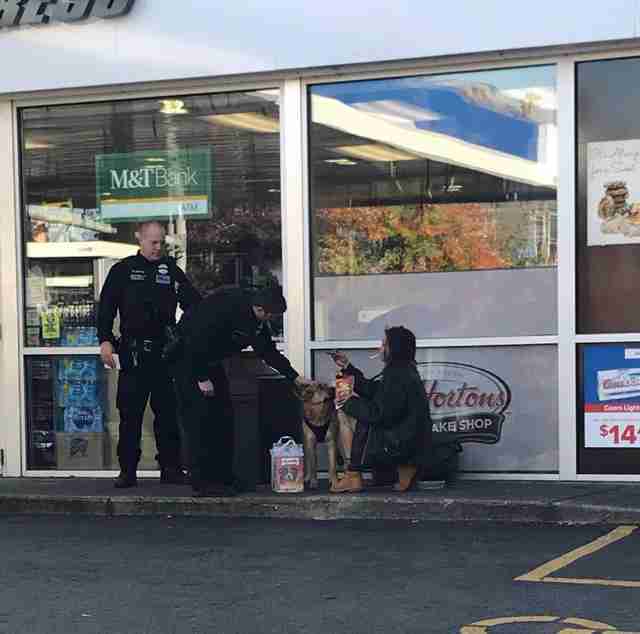 While waiting for her coffee, McNamara noticed the two officers were buying dog food and treats. Turns out, they were for the woman and her pup. "I walked out at the same time as them and heard the officer say, 'Here, I bought your dog some stuff,'" McNamara recalls. "Her face immediately lit up." Seeing that simple gesture of kindness had a profound effect on McNamara. "I started crying," she said. "I didn’t want to intrude on the moment too much so I continued into my car and secretly watched from afar. It was very selfless and genuine and real. It did not feel rehearsed or out of obligation. It was very real. Truly beautiful." For the next several minutes, McNamara observed as the officers cordially spoke with the woman and pet her dog. While we can only speculate on their background and level of need, the pet owner and pup seemed to appreciate the warmth and generosity they were shown. McNamara surely did. "We live in a beautiful world and, despite the negativity that often rises to the headlines, there is still good out there," she said. "A lot of it." To help animal owners near you who may be struggling or facing care challenges, consider making a donation to the charity Pets of the Homeless.